Five is small number, right? Except if you're talking about five papers to write in one weekend, five loads of laundry to wash, dry, fold, and put away, or five blogs out of the gazillion blogs that I consider my favorite. Funny enough, I actually chose five of my favorite blogs and wrote on why I loved them back in October. 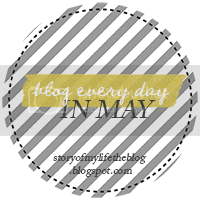 So instead of simply re-posting that one, I'm picking five other blogs that I love and haven't shared yet. These are five blogs that I whole-heartedly adore for very different, but very good reasons. Andrea is an outstanding photographer and I love each and every single photo she posts. It's hard not to fall in love with her photos when she has some seriously adorable kiddos to take photos of, too. John and Sherry's blog was probably the first official blog that I ever started reading. I'm not sure how I came across their blog, but I've been hooked ever since I found out they do it for a living. They're hilarious, I love their interior decorating style, and I love their daughter, too. I think pretty much everyone knows about Jami. She's hilarious. She's honest. She takes amazing photos (she's a photographer, too) and she's so inspiring. I love her passion for modesty and sharing stories. She's pretty much awesome. Elsie and Emma are two hard-working ladies. I love oohing and aahing over their DIY projects, recipes, and photos. Oh, and they also have a pretty awesome new photo-editing app, which just so happens to be my new fave. Rubyellen (don't you love her name?) is inspiring. I fell in love with her blog the moment I saw her daughters and learned the stories behind each of their names (it's awesome, so you should check it out). I love reading about her faith, her passion for healthy eating, and her family. I especially love seeing the similarities between her daughters and my sisters and I. What are your favorite blogs or daily reads? I love discovering new bloggers in this ever-growing blog community, so feel free to share any and all links in the comments below! I love YHL! I talk about Clara like I know her... my husband thinks I'm crazy. Hooray for a fellow YHL lover! :) Clara is beyond adorable and my older sister and I love to talk about how cute and funny she is. I love their posts on Clara conversations, that girl is hilarious!